IQRA NEWS | BREXIT MEANS BREXIT, DEAL OR NO DEAL – The will of the British people must be upheld ! The UK referendum of 23 June 2016 was a once in a lifetime people’s vote to make a final decision on whether the British people wanted to remain or leave the EU. The British people voted to leave the EU. 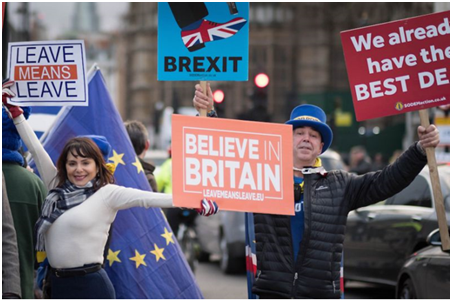 Remainers extremists are trying their utmost, with the help of forces from Brussels which keep interfering in UK’s internal affairs, to overthrow the wishes of the British people as expressed in the UK referendum of 23 June 2016. In many countries, this may well be regarded as treason. Remainers are even trying to incite riots in the UK : [« Queen would be ‘evacuated from London in event of no-deal Brexit riots’ », Colin Drury, Independent 03 February 2019], while the EU President, Donald Tusk said that Brexiteers deserve a « special place in hell ». In 1957, the Treaty of Rome was signed by 6 European states (France, West Germany, Italy, Belgium, Luxembourg, and the Netherlands), which created the European Economic Community (EEC), established in 1967. But French President Charles de Gaulle was against the UK joining the EEC. Charles de Gaulle resigned in 1969 after losing a referendum on a reform proposal for decentralization and changes to the Senate, which paved the way for the UK to join the EEC in 1973 under Conservative Prime Minister Edward Heath. Ireland and Denmark also joined that year taking the number of member nations to nine. Because politicians took the UK into the EEC without a referendum, pressure mounted on the government in favour of a people’s vote which was held in 1975 under Harold Wilson and the British people decided to remain in the EEC. As an economic union, the UK and other members fared well in the EEC club. In 1981, Greece joined, followed by Spain and Portugal in 1986, which brought the EEC membership up to twelve. When the then PM John Major signed the Maastricht Treaty of on 7 February 1992 to take the UK into the EU, Margaret Thatcher said that John Major « put his head on fire » by doing so. The British constitutional historian Vernon Bogdanor suggested that there was « a clear constitutional rationale for requiring a referendum » as the legislative cannot transfer the power of making laws to any other hands (EU Parliament). British politicians lied and misled the British people when they decided to take the UK into the EU without a referendum. The EEC was an economic union while the EU is both an economic and political union whereby the British people would lose their sovereignty and freedom to make their own laws as the EU Parliament could override the British Parliament; to control their own borders as migrants from EU members would be free to enter the UK unchecked, register for benefits, housing, free healthcare and education; to decide who they want to trade with. Also, British politicians did not inform the British people the amount payable to the EU every year is £19bn (less any rebate). Those payable billions could have been better spent on UK’s NHS, Housing, Education, Law & Order. 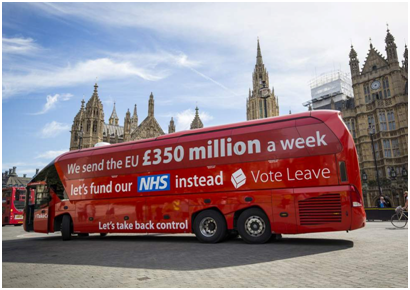 The Brexit caption on the side of the campaign bus citing the NHS as an example is correct and appropriate. The UK EU membership attracted non-UK speculators never seen before without knowing where their money came from. This also created a housing speculation and a class of scrounging landlords. House prices in London itself more than tripled in a space of 10 years and the young generation is unable to buy a house of their own, even if they save for 25 years. UK healthcare deteriorated as it is becoming a nightmare for the British person to obtain an appointment with his/her GP within a reasonable time. Appointments with GPs can take anything between 2 to 5 weeks as patients are redirected to nurses who even prescribe antibiotics and other medication before getting the prescriptions signed by the GP who has not even seen the patient. Health care has degraded. Public services and law and order are degrading as uncontrolled millions are flooding in like nobody’s business, while benefiting speculators and politicians who put the British people into this mess are laughing all the way to the bank. It should be noted that when the UK joined the EU in 1992, there were only 11 members. As soon as the UK joined, the EU membership rocketed to 28 and the UK bore the brunt of the influx. The British people demanded a referendum to decide whether to leave or remain in the EU. PM David Cameron of the Conservative Party, a Remainer himself, agreed to put the referendum before Parliament after assuring Donald Tusk, President of the EU, that MPs would not support the referendum legislation. But he was mistaken. The referendum was legislated for under the provisions of the European Union Referendum Act 2015 and was held on 23 June 2016, 24 years after the Maastricht Treaty. The referendum was a once in a lifetime people’s vote to make a final decision on whether the British people wanted to remain or leave the EU. The people voted to leave, which forced the resignation of the Remainer David Cameron who promised in his post-referendum speech that the will of the British people will be respected. David Cameron was replaced with Theresa May, another Remainer, who called a ‘Brexit’ General elections in 2017 and the Conservatives were returned to power to ensure Britain comes out of the EU. After those elections, Donal Tusk even discussed « reversing Brexit », given the dictatorship the EU has become. Trade deals were never a condition of the referendum. Helped by the EU ‘Remainers’ in Brussels, they are even trying to overthrow the results of the referendum by calling for another referendum, which is against all the democratic values the UK stands for. And, they do so with impunity. Governments do not hold referendums on trade deals. Moreover, Remainers are fabricating stories that if the UK comes out of the EU, the UK would cease to be a European country. Perhaps they should be reminded what Margaret Thatcher said in her famous 1988 Bruges Speech. She said : « Europe is not the creation of the Treaty of Rome. Nor is the European idea the property of any group or institution. We British are as much heirs to the legacy of European culture as any other nation. [..]We have not successfully rolled back the frontiers of the state in Britain, only to see them reimposed at a European level with a European superstate exercising a new dominance from Brussels. » This speech is said to have put Britain on the road to Brexit. There is no turning back however much French President Emmanuel Macron may spread the fake news that Brexiteers allegedly lied to the British people. On 29 March 2017, the United Kingdom invoked Article 50 of the Treaty on European Union (TEU) and gave formal notice to the European Council of its intention to withdraw from the EU, commonly called Brexit. The date for BREXIT was set for 29 March 2019. For 18 months, PM Theresa May has been negotiating with Brussels a withdrawal trade agreement, which will cost the British taxpayers a £40bn divorce bill, negotiation with the very persons who have been deriding the British referendum, people and politicians and using all sorts of threats and blackmail to prevent the UK from leaving the EU because there is a real risk that, once the UK leaves, the EU will collapse, bearing in mind that EU members like Greece, Ireland, Portugal and Spain are heavily indebted to EU, mainly to Germany and France whose leaders are dictating what they should do and how they should vote, not to mention that ‘European’ Poland, a Communist country until 1989 which joined the EU in 2004, is the biggest beneficiary of EU funds, while ‘European’ Turkey, a NATO member since 1952, is still on the waiting list to join the EU. PM Theresa May was wrong not to involve Parliament in the negotiation process with the EU. She made it her deal which she signed in November 2018. This deal, with an entrenched backstop for Northern Ireland would still keep the UK within the EU for an indefinite period without the UK having a say in anything. On 15 January 2019, MPs rightly rejected this deal with a huge majority (432 to 202), which forced Theresa May to allow Parliament to vote on the options at a later date. The MPs returned to Parliament on 29 January 2019. They gave Mrs May a mandate to renegotiate the Brexit deal with the EU in which she will seek to replace the controversial Irish backstop with an alternative, but they rejected a proposal to delay Brexit in order to prevent the UK leaving without a deal. However, they also supported a separate « non-binding » vote that stated the House of Commons rejected the no-deal option for now. As soon as the results of the votes were known, Brussels reacted immediately and said that there can be no renegotiation. The EU makes deals with many non-EU members, such as Canada and New Zealand. Why make it so impossible for the UK? The fate of the UK is in the hands of the British people, as a sovereign nation, and not in the hands of Brussels which has been dictating their lives for the past 26 years. Referendums are not held on trade deals. Britain has always been a great trading nation, trading with the world under WTO’s rules, without the permission of her European counterparts. Britain also heads the Commonwealth. The UK is a manufacturing nation, the 7th largest economy in the world, and she buys most of her raw materials, not from the EU, but from Africa and Asia. British MPs, Conservatives or otherwise, have a duty to put their heads together and uphold the will of the British people and take them out of this EU mess without delay, deal or no deal. 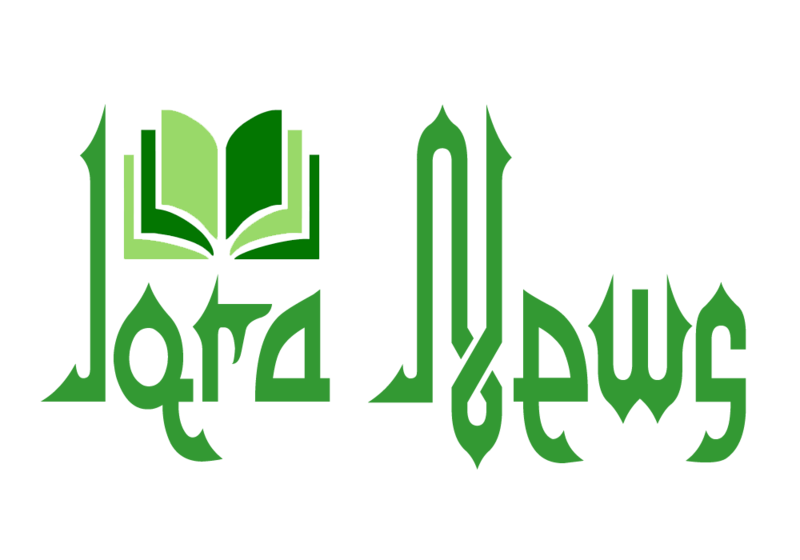 Disclaimer: Iqra News does not necessarily endorse the views expressed by contributors.